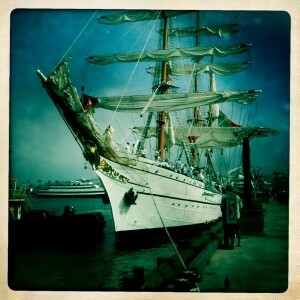 San Diego Travel Blogger | Katie S.
Posted on September 16, 2010 by Katie S.
Need weekend plans? With weather averaging 75 and sunny all weekend, there’s plenty to do outdoors! 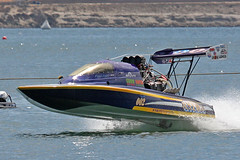 From full-throttle fun watching powerboat races in Mission Bay to a knee-slapping good time listening to bluegrass music in the scenic mountain town of Julian. • Banjos twang full force in the historic town of Julian during the 40th Annual Bluegrass Festival, September 18 – 19. The oldest bluegrass festival in California, many of the genre’s stars of today started on this stage. Festivities include banjo playoffs for all levels and foot-tappin’ fun. • Coronado Art Walk takes place September 18 and 19, from 10 a.m. to 5 p.m., at the Coronado Ferry Landing. Over 90 artists from around the country will be on hand displaying works ranging from paintings and photography to pottery, wood and glass pieces and jewelry. Attendance is free. Musical entertainment, family interactive art activities and double-decker buses to other Coronado sites will be available both days. • One tequila, two tequila, three tequila, floor! On September 18, the Spirits of Mexico Tequila Fair will be held in the State Park from 1:00 – 4:00 with free admission. The event includes the Taste of Old Town a sampling of fifteen of Old Towns finest restaurants with a tequila and beer tasting and live entertainment. Tickets to the food court are $25 – $30 at the door. • The NFL’s San Diego Chargers’ first home game of the season is this weekend against the Jacksonville Jaguars. See them this Sunday, September 19th and be sure to catch all the action of the 2010 season at Qualcomm Stadium in Mission Valley. 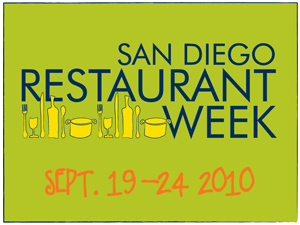 Posted on September 15, 2010 by Katie S.
San Diego Restaurant Week is just around the corner. The foodie in my is screaming, “YAAAY! Think of all the things I get to try this year,” while the sensible money-saver in me is screaming, “YAAY!! Three-course meals for only $20-$40 per person!” SO basically, every little part of me wins this battle. San Diego Restaurant Weeek takes place twice a year, once in January and once in September. It runs from 9/19 through 9/24 and includes over 180 of the city’s best restaurants. Everything from the waterfront Marine Room in La Jolla to the hip Croce’s Restaurant and Jazz Bar is offering these amazing deals. In January I went to Pacific Coast Grill in Solana Beach where you can not only bring your doggie to dine on their outdoor patio, but where I ate fish tacos that were literally to die for, come back to life again and continue eating good, and only $30. The other great thing about Restaurant Week is that most hotels are offering deals, so you can literally hop on the train from L.A., eat a delicious meal, spend the night at a hip, downtown hotel and then hop back on the next day. I think of this as the ultimate foodie slumber party. Since Restaurant Week hosts some of the most popular restaurants, it’s a good idea to make reservations in advance (are you on your phone yet?). Posted on August 13, 2010 by Katie S.
Just a heads up – This post was published in 2010. Friday the 13th is usually associated with being unlucky. Well if you’re an ink-addict, we’ve got some lucky news for you. For today only, San Diego tattoo shops are offering Friday the 13th tattoos for only $13. The following are a few of the shops in the county where you can find this special “holiday offer”. If you know of any other tattoo shops offering this discount please comment below! Posted on July 7, 2010 by Katie S.
We all watched Sesame Street, right? I grew up watching puppets solve problems, teach new letters and numbers, and singing songs about friendship, sharing and feelings. 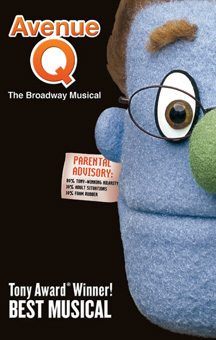 Avenue Q is a lot like Sesame Street, except puppets solve much more adult problems, learn about racism, and sing songs about the dark side of the internet. And Gary Coleman lives there too. It was amazing to see a cast of 6 people and a plethora of puppets that included humans, monsters and bad idea bears bring the Civic Theatre stage to life. This three-time Tony award-winning musical definitely earns all of its accolades. My husband and I laughed through the entire performance, and I don’t think I saw a single person sleeping. It was a great date night as long as you’re not taking someone out who is easily offended. If you get a chance to head downtown to see it I would 100% recommend it as long as you leave your little monsters at home. Avenue Q, presented by Broadway San Diego, is playing at the San Diego Civic Theatre through July 11th. For tickets and show times, please see the Broadway San Diego website. Posted on June 24, 2010 by Katie S.
This is it: Friday it will be a full year since we lost Michael Jackson, the King of Pop. Find a spot in San Diego to celebrate his life and remember his greatest hits. In honor of the first anniversary of Michael Jackson’s death, Hornblower Cruises and Magic FM has planned a rockin’ celebration onboard Inspiration Hornblower with a live band playing the pop star’s music all night long. Put on your white socks and black shoes and dance under the full moon on the sky deck 30 feet off the water and 10,000 square foot open air dance floor! A portion of proceeds Benefiting Lions Tigers and Bears, a non-profit rescue facility dedicated to providing a safe haven for unwanted and abused exotic cats. The San Diego County Fair has a full-day of Michael Jackson activities planned. Be on your toes all day, as two “flash mobs” are planned, with over 200 actors in full makeup will be performing the Thriller dance. Kids will have a chance to learn to moonwalk just like the King of Pop and take photos with Michael Jackson impersonators walking around the park. A special showing of “This is It” will be shown on the video screen at the Paddock at two separate times during the night, and “Who’s Bad: The Ultimate Michael Jackson Tribute Band” will be performing. So dig through your closet tonight, find your white, sequined glove, and wear it with pride at one of these celebrations tomorrow! 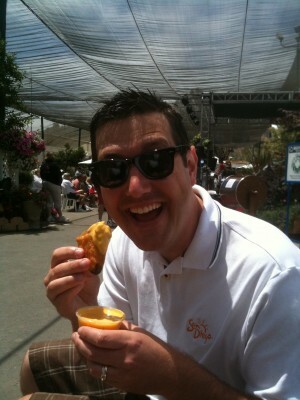 Posted on June 22, 2010 by Katie S.
In honor of the San Diego County Fair’s theme “Taste of the Fair,” my husband and I set out accomplish one goal: to find him the most outrageous fair food and take pictures of him eating it. After doing a pre-food walk around to listen to music and burn off some pre-feasting calories, we came upon one of my (guilty) fair favorites, the Australian Battered Potatoes. Think giant potato wedges, but more amazing and served in a bucket with nacho cheese and ranch dressing on the side. Although the potatoes were delicious, we were set out to find something outrageous. You can have french fries every day if you want. Maybe even french fries served in buckets. No, we were looking for the big-time fair food, and soon after, we found the fair food Mecca. 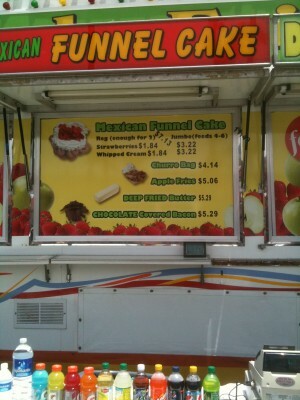 Everything we had hoped to find and consume at the fair was right in front of us. For those adventurous folks who are still reading, you can find this stand directly across from the bungee jumping, which I can assure you we did not try after eating. If you can read the food on the photo, you’ll see that this food stand had apple fries, chocolate covered bacon, and the fair’s newest addition, deep fried butter. Yes, fried butter, something that not even Paula Deen has created to my knowledge. Out to prove his manliness and show off his steel stomach, my husband ordered apple fries, chocolate covered bacon, and deep fried butter, with a side of Diet Pepsi. I watched in pure amazement and horror as my husband ate substantial amounts of each. And that right there my friends, is deep fried butter. 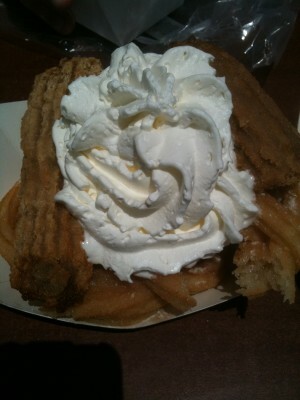 Two deep fried sticks of butter atop a cloud of funnel cake, topped with whipped cream. After consuming all three of these decadent items it was decided that chocolate covered bacon was the day’s winner. Served in a to-go box, it was perfect for toting around the fair and sharing with friends. In fact, he would have brought a box home had I not been worried about his blood pressure. Although we didn’t get around to trying some of the newest fair foods such as the four-pound belly buster burger, funnel cake on a stick or deep fried pop tarts, we’re hoping that some of you will get out to the fair to try these and let us know your verdict. The San Diego County Fair will be at the Del Mar Fairgrounds until July 5th, so make sure to save the date and some room in your stomach! Posted on June 18, 2010 by Katie S.
Need ideas for Father’s Day? Whether you’re looking for an aquatic adventure or a day exploring San Diego’s museums, we’ve got you covered. 1. Julian Gold Rush Days(6/19 – 6/20) – There’s gold in them hills! Celebrate the discovery of gold in this mountain town of Julian with two days of events including gold panning, living history demonstrations, gold mine tours, book signings, chili cook-off, children’s crafts, gold nugget scavenger hunt, face painting, old fashioned games, historic skits, and more. Dad will have a blast getting in touch with his inner mountanieer, and maybe go home with a little bit of gold in his pocket! 2. Beers and Brats Brunch Cruise (6/20) – What better way to spend father’s day than aboard a Harbor Excursion cruise with delicious food, spectacular water views and endless flowing beer? Make reservations to spend the day on the bay with with an all-you-can-eat buffet. We can promise your dad (and his stomach) will thank you! 3. Father’s Day Kayaking (6/18 – 6/20)- Dad’s paddle out for free during Father’s Day weekend. Choose to cruise out of either Hike Bike Kayak’s Mission Bay or La Jolla locations and get ready to see San Diego sea life up close and personal. 4. San Diego Padres vs. Baltimore Orioles (6/18 – 6/20) – What better way to bond than over America’s favorite pastime? Catch a Padres game at PETCO Park during their three-day series against the Baltimore Orioles. Afterwards, check out what’s going on in the Gaslamp District and grab a bite to eat at a local restaurant. 5. Free Day at the Fleet (6/19 – 6/20) Dads get free admission during Father’s Day weekend at the Fleet Science Center! Spend the day playing with the museum’s interactive exhibits and take the time to see the newest IMAX flick. Posted on June 7, 2010 by Katie S.
This morning I was able to see the Portugese tall ship Sagres make its way into the Embarcadero. I was able to see the sails all the way from my office, and made it down there just as the sailors were docking. It was amazing to see a full crew make its way into the port and watch them lift sails and throw lines to come ashore after their long journey from Portugal. The 295-foot-long ship serves as a training vessel for cadets in the Portuguese Navy and as a traveling goodwill ambassador for Portugal. It is also the sister ship to the U.S. Coast Guard ship, Eagle. From San Diego, Sagres will sail across the Pacific to Honolulu, Hawaii, and onward to World Expo 2010 in Shanghai, China. Sagres will be docked across from the Maritime Museum for the rest of the week and will be open for touring, which is free to the public. Touring hours vary, so please check here before visiting. I can’t wait to get on board to sneak an insider look at this historic boat. Posted on April 20, 2010 by Katie S.
San Diego realizes that many visitors are stranded due to volcanic ash. In support, the following hotels and attractions are offering special rates to accommodate visitors during this time. – Motel 6, 3708 Plaza Dr., 760.941.1011, $39.60 per night. – Motel 6 Downtown, 909 N Coast Hwy., 760.721.1543 $49.99 per night w/ micro & fridge. – Holiday Inn Marina, 1401 Carmelo Dr., 760.231.7000, $99.00 per night. – Residence Inn by Marriott, 3603 Ocean Ranch Blvd., 760.722.9600 $129 per night. – Wyndham Oceanside Pier Resort, 333 N. Myers Street, 40% Off. – Days Inns Days Oceanside, 1501 Carmelo Drive, 760.722.7661. 15% off rack rate. – Sheraton Suites, 701 S Street, 619.696.9800. $79 rate, 5 minutes from airport. All stranded visitors must present a valid return airline ticket with dates from April 20th-April 27th, 2010 or until normal flight schedules return.